The “Googleplex” as Google Inc. corporate headquarters is colloquially known, occupies a series of corporate campuses in Mountain View, CA, bordering the southern shore of the San Francisco Bay. While the landscape of Silicon Valley has, since WWII, been transformed into a largely undifferentiated expanse of suburban residential developments interspersed with low-rise office and research parks, the Googleplex (along with a few other tech-giant HQs such as Apple’s) is singular enough that it has become interchangeable with it’s location. Around the world, Mountain View, this smallish, superficially unremarkable corner of the San Francisco peninsula has become synonymous with all things Google. The heart of this is the actual Googleplex, an open-plan cluster of four low-slung office buildings housing various central divisions, around a plaza filled with brightly colored tables with patio umbrellas in Google’s signature primary colors, and interspersed with grassy landscaping that links the campus to the adjoining “public” Charleston Park. Much as the company itself began with its eponymous search engine and has incrementally expanded into other aspects of information technology from e-mail, to social networks, to defense contracting, Google HQ sprawls from the central Plex for many blocks north, south, and west, incorporating all available nearby structures. 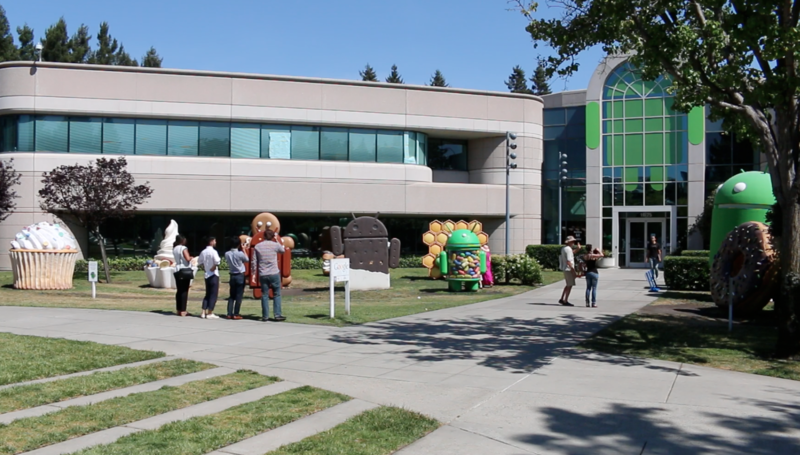 ValleyWag reports that Google has acquired some 24 buildings in the vicinity just since 2011. Employees are encouraged to navigate this terrain using Google bikes, again painted the company’s signature red, yellow, blue, and green, or to connect to other satellite hubs within the greater Bay Area, from San Jose to San Francisco, using Google’s fleet of privately run coach buses, self-driving cars, or shared electric cars. While Google paints all of its facilities and workplace programs in primary colored, win-win light, the suburban, open-plan ideal of a corporate headquarters is actually a modernist, mid-century innovation. Following WWII, larger corporations, in particular those of a technological bent, fled the zoning restrictions and perceived “unpredictability” of urban areas, to be able to house all of their various departments in purpose-built structures adjoining desirable suburban areas. As described by Louise Mozingo in Pastoral Capitalism, the corporate campus gained a foothold in “suburban expansion zones [that] were deliberately resistant to change, with the end of producing both social stasis and secure real estate values.” While developments of this kind served both capitalist aims for corporate growth as well as managerial class anxieties about urban space, their design “reflected a more ineffable yet deeply ingrained value—the ideal of the pastoral in the American landscape." What is now the Googleplex began its existence as a campus for Silicon Graphics (SGI), which, in 1997, was considered innovative for it’s incorporation of public parkland and underground garages. Yet, in it’s push for the pastoral ideal, SGI built over the last remaining working farm tract in Mountain View, if not in Silicon Valley as a whole. Google acquired the campus in 2003 and commenced with retrofitting the buildings to its modular, café-laden preferences. Google proudly boasts that 4.5 million square feet of its offices worldwide have been redesigned to LEED-certification standards, not including the new nine-building Bay View campus being built adjacent to the Googleplex, which will debut in 2015 as LEED Platinum. At that point, Google HQ in Mountain View, sprawling across more than 65 buildings, will contain some 3.1 million square feet of office space. It is worth noting that Google’s New York City base, the former Port Authority Headquarters in Chelsea, encloses 2.9 million square feet of office space within the confines of a single one-block-square building in a highly pedestrian corner of the city adjoining the Highline public park, and countless restaurants, bars, markets, and high-rise residential buildings. Google Mountain View, however, is a essentially a moated environment—what The Verge calls “Googletown”—cordoned off by the 101 Freeway on one flank and the San Francisco Bay on the other. Nearly all the buildings in any direction are company property and there are hardly public businesses of any kind, though if you are a salaried employee, there are cafés, restaurants, gyms, salons, and other services aplenty. Despite the sunny, Californian trappings of the buildings with their courtyards and many windows, they still turn their substantial backs to the streets, their main entrances facing each other and flanked by corporate security. 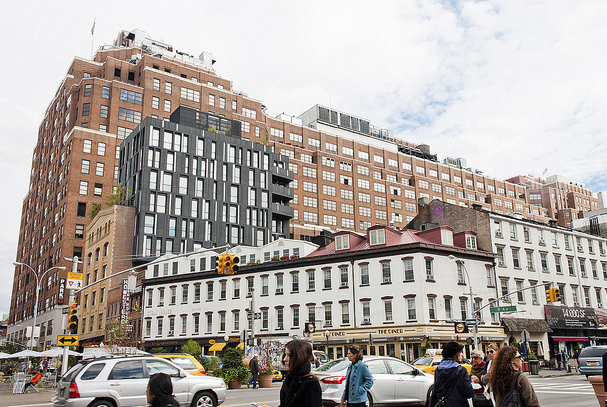 Despite Google’s claims of sustainable innovation and attempts to change zoning laws to allow higher-rise development on their properties, this bunkered, anti-urban design serves the corporation’s business interests quite capably. Precious tech secrets cannot be spilled if engineers have no need to leave Googletown for lunch meetings, routine medical appointments, haircuts, etc. While the company is at odds with the city of Mountain View over whether it can build housing nearby for its employees, it has found a stop-gap measure in ferrying Googlers to the relatively higher housing density of San Francisco in Wi-Fi equipped private buses, where they can continue to work during their commutes (and with socially disastrous “disruption” to San Francisco communities). This logic carries through to Google’s recent acquisition of nearby Moffett Field from NASA for the construction of its own private airport. At a 2013 programming conference, a Silicon Valley-based senior engineer gave a highly publicized talk where he advocated for abandoning the outmoded idea of work-life balance in favor of what he called “Nerd Life Balance” in which is there is no theoretical solid ground to argue against working 12-hour days, sleeping in company nap rooms, and never needing to leave campus for basic services and amenities. With starting salaries for most techies north of $80,000 per year and such comprehensive benefits, many see no inherent problem in signing their lives away to Google or its sibling-competitors. With concerts, classes, and public speeches by luminaries from President Obama to Tina Fey to Michael Pollan right on the premises, Google leverages its substantial assets to bring the world to its employees; much like the search results presented by it’s eponymous engine, however, it is a world heavily filtered.